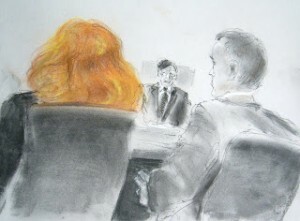 ‘Can a cached copy be used to make a hard copy?’ a judge asks a QC. There is a pause. I nod vigorously, and pointlessly, from the public seats. Public Relations Consultants Association Ltd v the Newspaper Licensing Agency & Ors is being watched like a hawk by press cuttings agencies who feel that copyright laws are limping after new technology. So are copies created when accessing a web page exempt from copyright protection by virtue of the temporary copies exception under the Copyright, Designs and Patents Act 1988, s 28A? I wonder what the average teen hacker would make of all this. In the legal seats today there are massed ranks of alert brains. 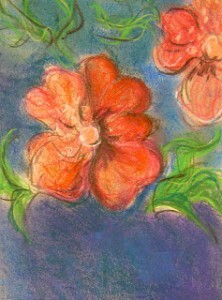 I’m finger-painting with charcoal. From the public seats, you are conscious of two tectonic plates pushing against each other. 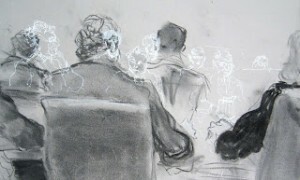 The legal teams are turned away from you; as they shift in their seats they conceal and expose the more distant judges and court staff facing you. Talking of digital technology, I see that I have a skill which Lord Neuberger doesn’t: the dying art of touch-typing which allows your speed to emulate Concorde (which has gone the way of touch-typing). There’s nothing perverse about a blank keyboard as far as I’m concerned. But Lord Neuberger’s left index finger is elegantly raised, kept out of use, rather than lightly resting on its home key of F from which R, T, G, B and V are within easy reach. Henry Carr QC is extraordinarily animated on his feet. A shape-shifter. I can’t pin him down on paper. 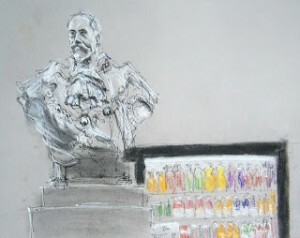 Afterwards, in the basement canteen, I find someone who keeps still: Edward VII, whose flattering marble bust turns its back on the refrigerated cabinets. I t’s a slushy time of year. The flowers on the Court 2 curtains offer themselves to view. 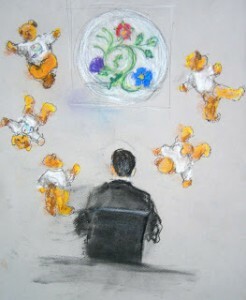 I buy and then liberate the Supreme Court teddy bear, who in gratitude performs some putto moves around the back view of Robert Howe QC, defending. The bear is heavily influenced by the putti action in Watteau’s Le pèlerinage à l’île de Cythère (see below). 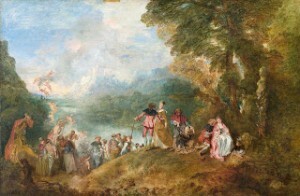 Le pèlerinage à l’île de Cythère by Watteau. Oh, but are the lovers arriving at or retreating from the island of romantic escape? And here I really want to quote W. H. Auden’s poem Law Like Love in its entirety. But it’s protected by copyright. The first copy of it you find on the internet may well be pirated. What to do? Detail from the Court 2 curtains, loosely interpreted. As someone sitting in the row behind you on Monday while you drew, I have say your artwork and words beautifully captures the texture of the day. 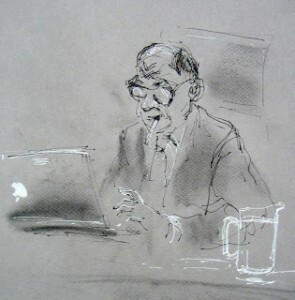 I instantly recognise the little vignette of Lord Justice Neuberger’s typing, pen in mouth! It’s rather a shame that you weren’t there on Tuesday to capture Lord Justice Sumption’s wildly tempestuous hair – something we would have been denied had their Lordships been wearing wigs. I love these. And your rendering of the curtain flower reminds me that I spent an appreciable portion of one of my Final exams drawing the ceiling of the Exam Schools, which may go some way to explaining my results. 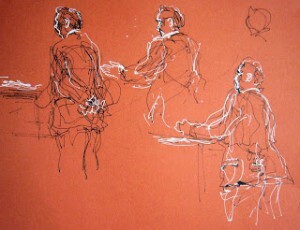 Leave a reply on "Supreme Court Art: love, music and copyright"